Enterprise Social Media Management Whitepaper | Brandle Inc. 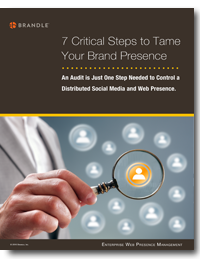 This white paper by Brandle ® highlights the 7 critical steps every enterprise needs to take to manage their distributed brand presence. Discover why a social media and web audit is your first step. Learn the importance of assessment and inventory. Determine how your team should work together and how your manage access and control. Define your compliance criteria for policy, regulatory adherence and sound governance.